fruit . root . leaf . : Il fait froid, ici! Brrrrr....! It is all-caps COLD here - windy, and the temperature is plummeting. We're supposed to get down to -30F or colder with windchill by this evening. Here are a few snapshots, to share the invigorating reality of winter all bundled up and piled waist-deep in snow. 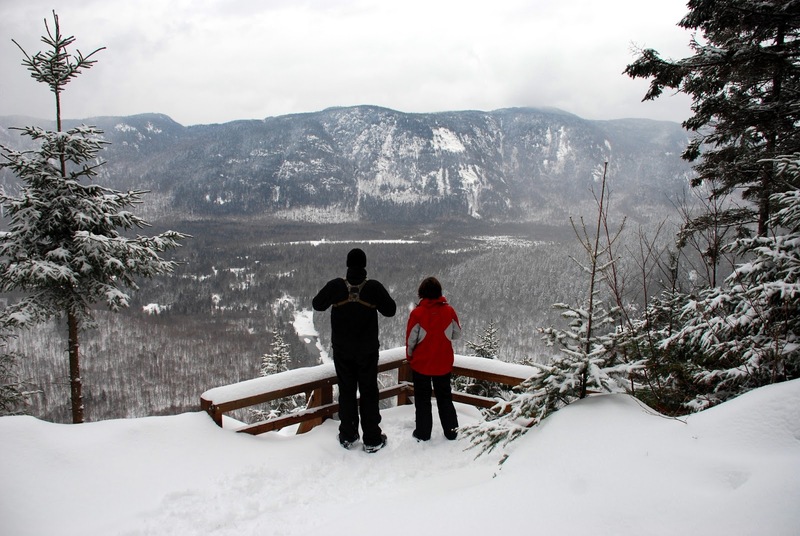 Click here to read my recent QCT article about a backcountry snowshoe trip we did. You'll see some of the pictures below. heavy - as seen from our front door. us on snowshoe expedition in Vallée Bras-du-Nord. Vieux-Québec lit up during holiday evenings. Looks pretty darn cold there, Bethann. Sarah and Ryan and I skied at Teton Pass on Monday, and I estimate the wind-chills at the top of the chairlift probably were about -15 to -20F. Felt so cold that I quit early, which I rarely ever have done. Then it turned warm, and the past couple of days it’s been in the high +40s. Miss you guys, too. It is cold, cold, cold. I have errands to do, but I really think I will wait a couple days 'til it warms up. Wow! If it is cold enough for you to bow out, it is seriously cold. It is quite cold here, and I'm not even outside yet. :) Even the kitchen is cold!